Complete Design Flexibility Made Easy! GiftSuite's ecommerce system is extremely customizable. Most web-based catalog software gives you fixed templates - GiftSuite ecommerce software gives you building blocks and the ability to customize virtually every element on your pages using simple Cascading Style Sheets. Note that there are many possible combinations and only a few are shown below. 3. Product Display Pages show each item along with its associated information. Below are examples of the Category Display Page showing various configurations of the page building blocks. The building blocks are illustrated with color-shaded overlays. Each is explained in the paragraphs below. 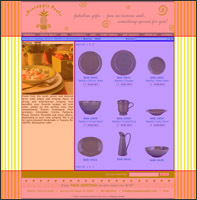 Set your ecommerce page content area to any width you like based on either pixels or percentage of browser page width. You can select the number of item rows and columns, as well as turning on and off various building blocks to make your catalog work the way you want. 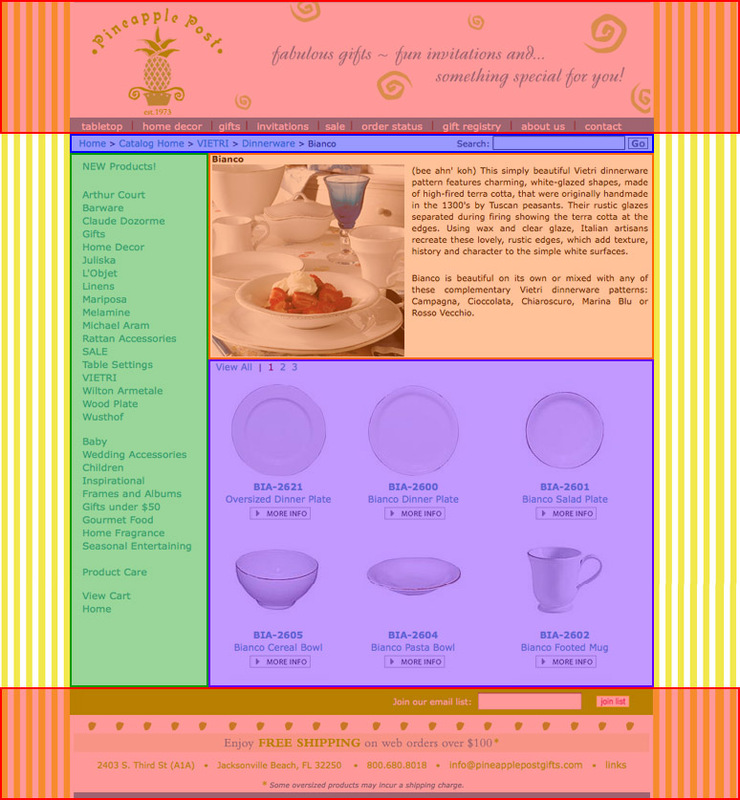 All pages within GiftSuite include the ability to include a custom HTML page header and footer. These top and bottom portions of your pages can be set to a fixed width (as shown in these examples) or set to a percentage of screen width or even full screen width. The grey area you see here denotes the content area. Every page of your catalog can display your own custom wallpaper that you upload to the via the administrator. 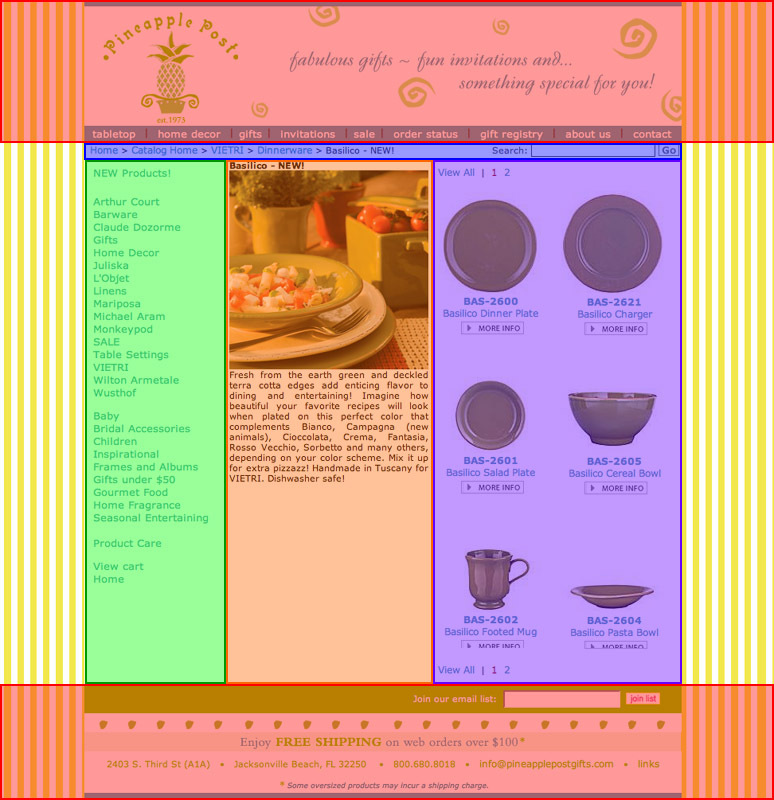 If you set the width of the page content area to less than 100% of the browser window size, any part of the non-content area can be either a color or wallpaper (wallpaper is visible in these examples). In blue is the Navigation Trail and Search Bar. The Navigation Trail shows the customer the path they have taken through the category tree to reach the section they are viewing. The customer may click on any link in the trail to move back up to any previous level. The search feature allows the customer to search the entire catalog for any specified keyword or key phrase. In green is the menu block. 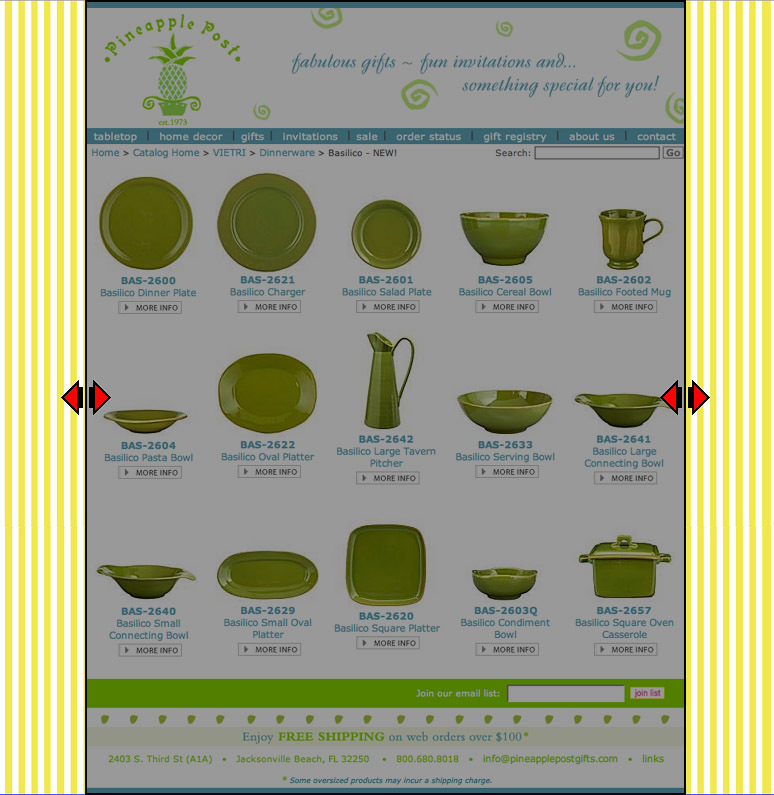 In addition to automatic display of top-level categories, you may add your own custom links to the menu system. In purple is the Product Display Block. In this section, you define the number of rows and columns that you wish to display on this page. 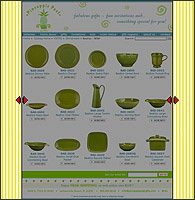 GiftSuite will automatically calculate the required number of pages to display all products in the category and will provide links to each on of these pages along with a "View All" option. Shown in blue is the Navigation Trail and Search Bar. The Navigation Trail shows the customer the path they have taken through the category tree to reach the section they are viewing. The customer may click on any link in the trail to move back up to any previous level. The search feature allows the customer to search the entire catalog for any specified keyword or key phrase. 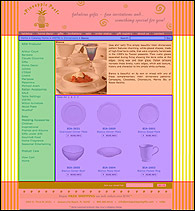 Shown in green is the menu block. 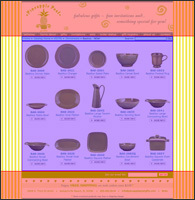 In addition to automatic display of top-level categories, you may add your own custom links to the menu system. Shaded in orange is the Category Description Block, this time in its horizontal configuration. This block contains the main category image which is normally a glamour shot that depicts the type of items found inthe category along with a text description of the category. With the Category Description block positioned horizontally across the top of the products, the number of columns can be increased to show more per page. Shown in purple is the Product Display Block. In this section, you define the number of rows and columns that you wish to display on this page. 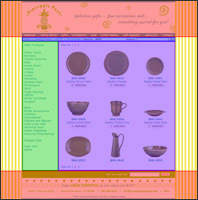 The catalog will automatically calculate the required number of pages to display all products in the category and will provide links to each on of these pages along with a "View All" option. In this example, the Category Description block has been disabled. This leaves more room for columns of products and still leaves the Menu (shaded in green) and Navigation Trail & Search Bar (shaded in blue) blocks visible. 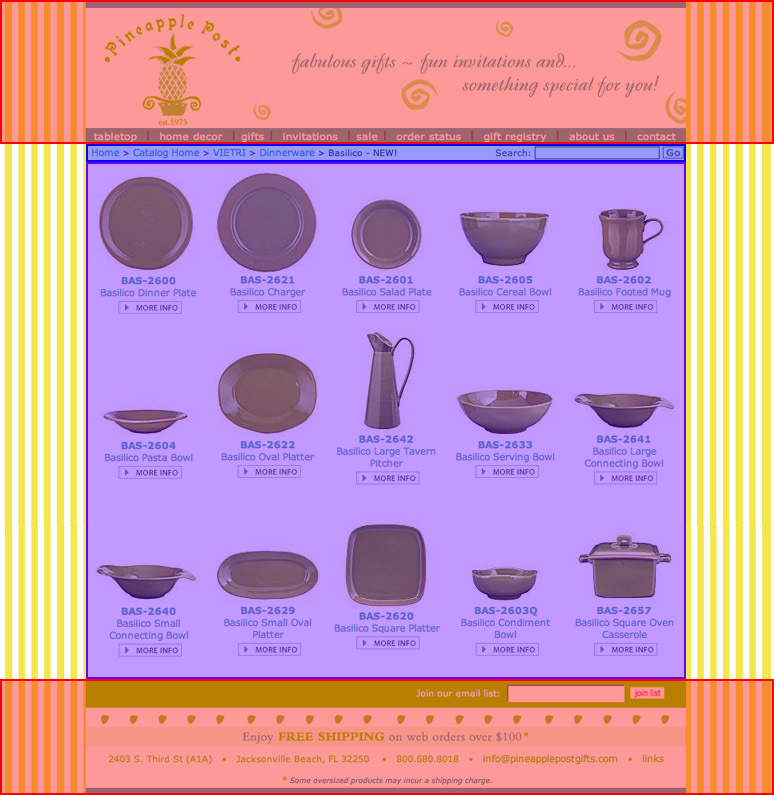 The advantage to this configuration is the ability to show more products (in the purple shaded area) on fewer total category display pages, thus simplifying catalog navigation for your customers. Because the product image thumbnail size is completely selectable, by using smaller images, you can increase the number of rows and columns beyond the 3 by 3 arrangement you see here. 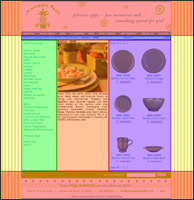 In this example, the menu block has been disabled. 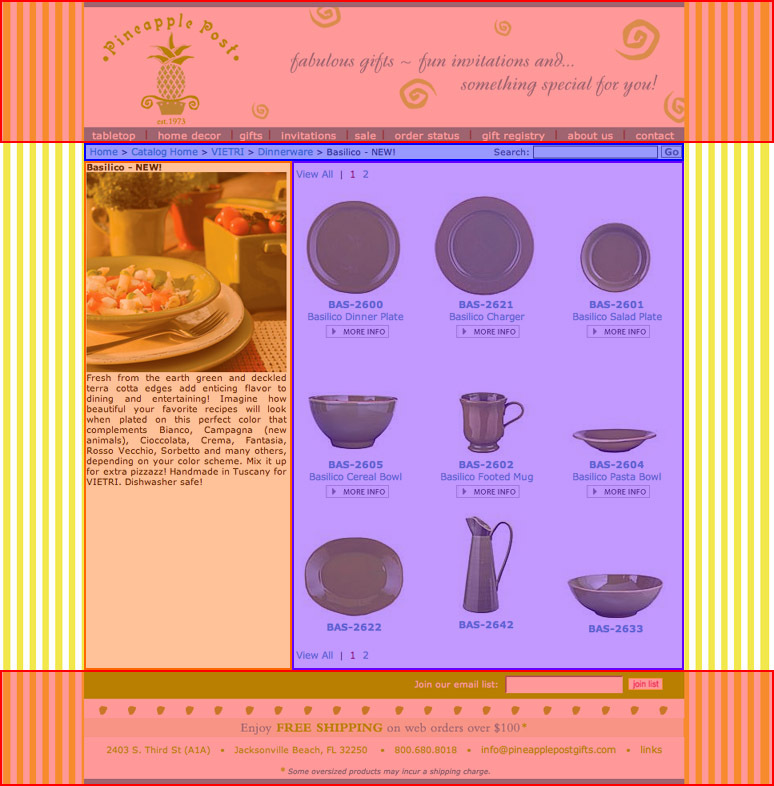 This leaves more room for more columns of products and still leaves the Catalog Description Block (in orange) and Navigation Trail & Search Bar (in blue) blocks visible. The advantage to this configuration is the ability to display more products (in the purple shaded area) on fewer total category display pages while still including the category glamour shot and descriptive text. 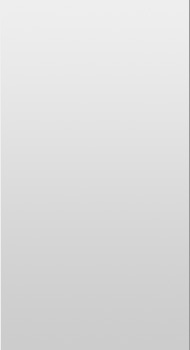 In this example, both the menu block and the category description block have been disabled. 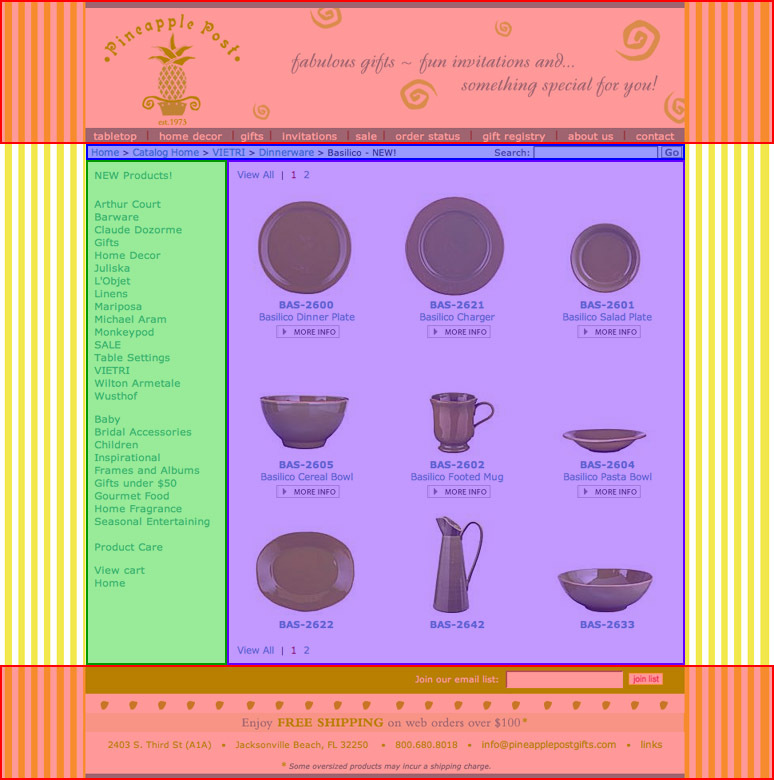 This configuration allows you to maximize the number of products visible on these pages while retaining the Navigation Trail & Search Bar (shaded in blue). Without a menu, it will be most important, if you use this configuration, to provide direct navigation to the various parts of your catalog through your custom header. Using links to your top-level categories or a series of drop-down menus is the most effective way to provide this kind of navigation. Because the product image thumbnail size is completely selectable, by using smaller images, you can increase the number of rows and columns beyond the 3 by 5 arrangement you see here.